Ships free in 4-5business days per UPS Worldwide express, well packed and fully insured. This beautifully crafted 18 1/2 inch 8 day cuckoo clock by Rombach & Haas features two 3-dimensionally carved owls with glass eyes on top, 2 birds on the side and a cuckoo nest on the bottom. 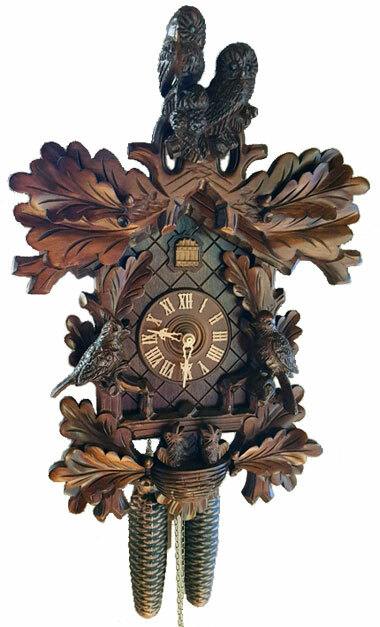 Clock features wooden dial, hands and cuckoo bird as well as a night shut off to silence the cuckoo call. 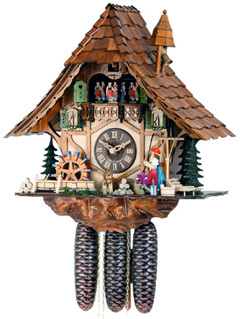 Beautiful cuckoo clock with high quality german Regula movement for a great price. Founded in 1894, the company is now managed in the fourth generation by Ingolf and Conny Haas. The inside of the building has not changed much. Workbenches from the 18th century are still in use, the clockmakers walk on ceded wooden floors and the components are still taken from drawers with porcelain knobs, which were already used more than 100 years ago to store similar parts. Ingolf Haas works hard to maintain the historic work atmosphere and promises to continue to ensure all timepieces to be manufactured in this unique ambiance. Romba clocks have made a name for themselves worldwide in terms of quality, design, inventiveness and diversity. Rombach & Haas also came up with the idea to expand the supply of shield-clocks (1st generation) and traditional cuckoo clocks (2nd generation) by a new production line modern cuckoo clocks in a timely design (3rd generation) in 2005.